La Maison de l'amitié (English: House of Friendship) is a work of the Mennonite church in Montréal. It has striven to be a community of reconciliation, reflecting Anabaptist principles of service and peacemaking, through ministry to newcomers and others seeking aid. Specific ministries have included language classes (French and English), a student residence, a farmer's market and an annual Peace Festival. It has also rented space to worshipping communities including the Mennonite Fellowship of Montreal, as well as many other groups. In 1973, in the wake of Quebec's Quiet Revolution, several Mennonite groups cooperated in founding Maison de l' amitié at 120 Duluth St. East, Montreal, with the intent of working with the needy in a poor area of the city. The Mennonite Mission Board of Ontario (now Mennonite Church Eastern Canada Mission Council), Mennonite Central Committee (Canada), the church in Montreal North planted by missionaries Harold and Pauline Reesor and Tilman and Janet Martin, along with an inter-Mennonite group affiliated with McGill and Concordia universities, purchased the Ukrainian community Centre and Credit Union, formerly one of the Jewish Peretz schools. This group, mirroring Quebec's vision of cultural communities, articulated its mission as establishing "caring, Christian communities – meeting the needs of the various cultural groups – letting members of each community look after each other's needs." In its early years, Maison de l' amitié opened Garderie Duluth to provide day care for the children of immigrant and low income families, including French Canadians. It also started a half way house and organized regular prison visitation by volunteers. This included setting up an organization for inmates, Conseil Chrétien de reconcilication (CONREC) and later de personne à personne (P2). By the early 1990s, the focus was mostly on serving newcomers to Canada. Maison de l'amitié invited other institutions focused on refugee concerns to come under its roof. In 1994 Garderie Duluth moved to a new location and the United Church-run Project Refuge took its place. Réseau d'intervention auprès des personnes ayant subi la violence organisée (RIVO), the Mennonite-run Family Refuge and a community drop-in expanded the ministry. 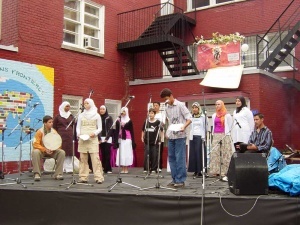 Mennonite Central Committee, Mennonite Church Eastern Canada and Mennonite Fellowship of Montreal were the major financial supporters of la Maison de l'Amitié until 2004, when budget cuts coincided with federal government changes to its safe third country laws. These decisions forced Maison de l'amitié to search for alternate ways to serve. The revised vision resulted in the continuation of language classes and the launch of a student residence which opened in 2006. Other new projects included Marché Fermier, a local urban farmer's market, and Greening Duluth, which focused on a variety of environmental concerns. Two renovation projects have facilitated changing program needs, the first in 1989 to facilitate refugee work, and another in 2005 for the student residence. Maison de l'amitié has played a significant role, from the 1970s, in seeking ways to respond to the mounting refugee crisis. 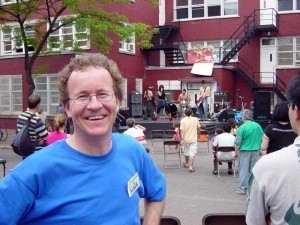 It has provided leadership in urban ministry both in the Mennonite church and in the ecumenical context, sometimes with significant challenges. In the mid-1980s Maison de l'amitié found itself responsible to Canadian Immigration for eight men who had failed to keep their bonds to the tune of $46,000. Possibly the most controversial moment came in winter of 1987 out of a hunger strike organized by Juan Iturriaga. Iturriaga was a Chilean refugee employed by Maison de l'amilié as a community worker and supported by the broader Mennonite church for his ministry to refugees. Juan Iturriaga and others protested against Canadian immigration for refusing entry to Chilean refugee claimants. Legal difficulties ended in the termination of the Spanish ministry. Despite these and many other challenges, Maison de l'amitié has been a noteworthy Mennonite presence in Montreal, keeping the Anabaptist vision of creating community, and of peace and justice, while reflecting a Mennonite concern for refugees. Over the years, amidst may challenges including finances, the house has hosted thousands of refugees and others from a broad variety of cultural communities. Lucille Marr. "A Lonely Outpost: The Mennonite Maison de l'Amitié of Montreal, 1973-2006." Journal of Mennonite Studies 24 (2006): 149-168. Correspondence, board minutes, directors' and program reports, and photographs are housed at Maison de l'amitié. Marr, Lucille. "Maison de l'Amitié, La (Montréal, Québec, Canada)." Global Anabaptist Mennonite Encyclopedia Online. January 2012. Web. 25 Apr 2019. http://gameo.org/index.php?title=Maison_de_l%27Amiti%C3%A9,_La_(Montr%C3%A9al,_Qu%C3%A9bec,_Canada)&oldid=138001. Marr, Lucille. (January 2012). Maison de l'Amitié, La (Montréal, Québec, Canada). Global Anabaptist Mennonite Encyclopedia Online. Retrieved 25 April 2019, from http://gameo.org/index.php?title=Maison_de_l%27Amiti%C3%A9,_La_(Montr%C3%A9al,_Qu%C3%A9bec,_Canada)&oldid=138001. This page was last modified on 6 October 2016, at 06:35.